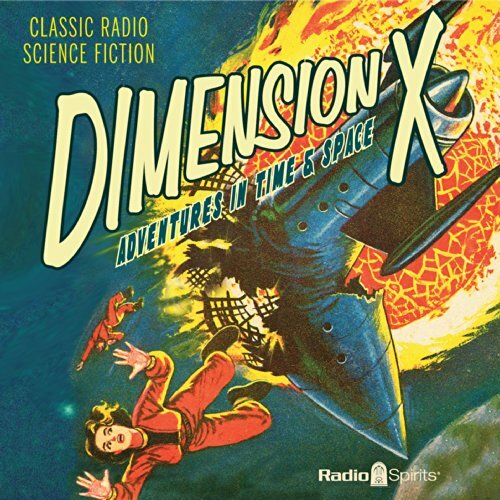 These first episodes of the Dimension X series - including stories by Kurt Vonnegut, Robert Bloch, and Robert Heinlein - feature performances by Staats Cotsworth, Raymond Edward Johnson, Les Damon, Bill Lipton, Berry Kroeger, Jan Miner, Joan Alexander, and more. Episodes include: "The Outer Limit", 04-08-50; "With Folded Hands", 04-15-50; "Report on the Barnhouse Effect", 04-22-50; "No Contact", 04-29-50; "Knock", 05-06-50; "Almost Human", 05-13-50; "The Lost Race", 05-20-50; "To the Future", 05-27-50; "The Embassy", 06-03-50; "The Green Hills of Earth", 06-10-50; "There Will Come Soft Rains/Zero Hour", 06-17-50; "Destination Moon", 06-24-50; "A Logic Named Joe", 07-01-50; "Mars Is Heaven", 07-07-50; "The Man in the Moon", 07-14-50; "Beyond Infinity", 07-21-50.
classic radio sci-fi! 30 minute short stories. loved it! you can get most of these recordings free online but I had a free audible token. I'd buy this kind of entertainment. No losers here. If you are a SF fan you'll enjoy this collection over and over. I heard these radio broadcasts in the 1950s and still enjoy listening to them almost 60 years later. This is a must have for all Sci-fi fans out there. The audio was clear and crisp.